Myanmar/ Burma with Kids. Inle day 3. Indein and back to Nyaung shwe. It was our last day staying on the lake and we decided to visit Indein. Indein is a popular tourist stop, since it hosts one of the major markets in the area. 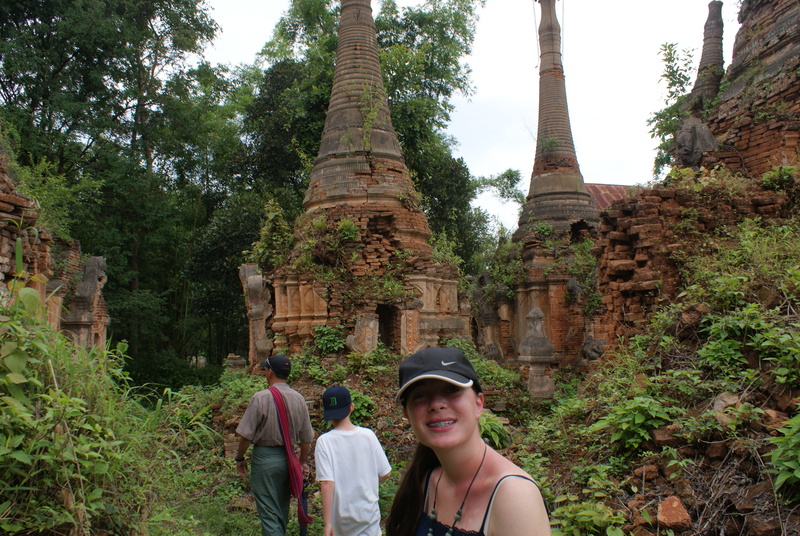 This was not market day, but we felt that Indein would be worth going to, since it has ruined Angkor -like “baby stupas”. Indein is not like Sankar. While Sankar had been quiet to the point of being somnolent, when we got off our boat at the jetty at Indein we were immediately met by souvenir stalls and sellers. Tourism has a firm foothold here, yet these are still gentle, peaceful Burmese, who one feels would rather die first than offend any tourist by hassling them or otherwise. So they wait patiently in their stalls and if you happen to stop and take a look they are gracious and thankful. At Indein it was definitely necessary to bargain – prices were much higher than some of the more out-of-the-way spots we had been to. I bought the boys small metal fish – I can’t say what they were made of but they were extraordinary as each fish had about 20 moving parts – a real work of engineering, for the price of a couple of dollars each. The ruins at Indein are awesome. They date back a few hundred years (nobody is really certain) but much like at Angkor before restoration, the jungle has taken over the stupas and temples, so that today you have the trees growing inside and over the brickwork. Exploring the ruins is hugely exciting, and a great experience for kids. Best of all, there were very few other tourists – we felt like we had the whole place to ourselves. In Indein village we visited the local kindergarten. We had visited a school in Hsipaw and another in the Kengtung area already, but every school visit is a highlight when traveling with kids. The trip really takes on meaning to my kids when they see how other children live. Since this kindergarten was operated by Unesco and not by the government, they were thrilled to see us and happy to invite us in to take a look. We were very impressed. 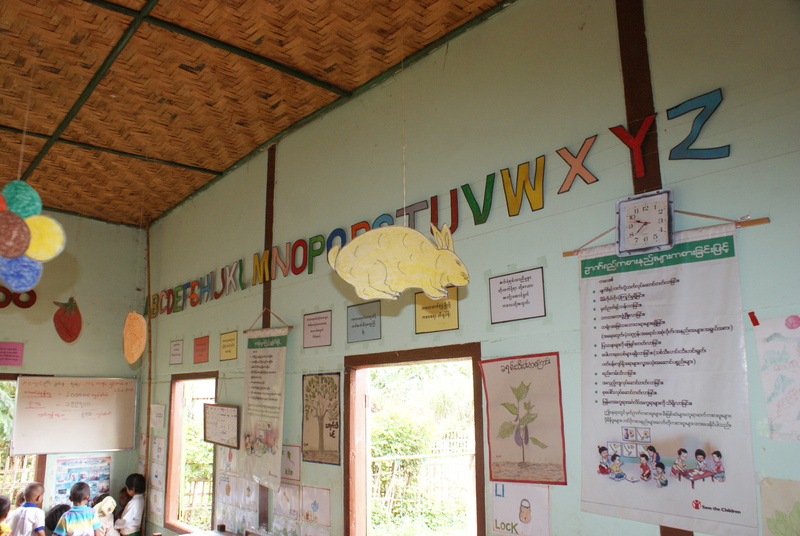 A large playground outside, and a good size room inside with really nice learning materials. Another clear sign of the importance of education in Myanmar (see also my previous blog entry on Education in Myanmar from October). While walking back to our boat we encountered a child collecting the most massive slug type insects we have ever seen. Apparently a great delicacy, it reminded us of pictures we had seen of Australian witchety grubs. Back at our hotel we packed up and left for Nyaung Shwe where we would be staying for two nights. The travel guides and the online forums are undecided over which is a better place to stay for the Inle experience – on the lake or in Nyaung Shwe. We would see. 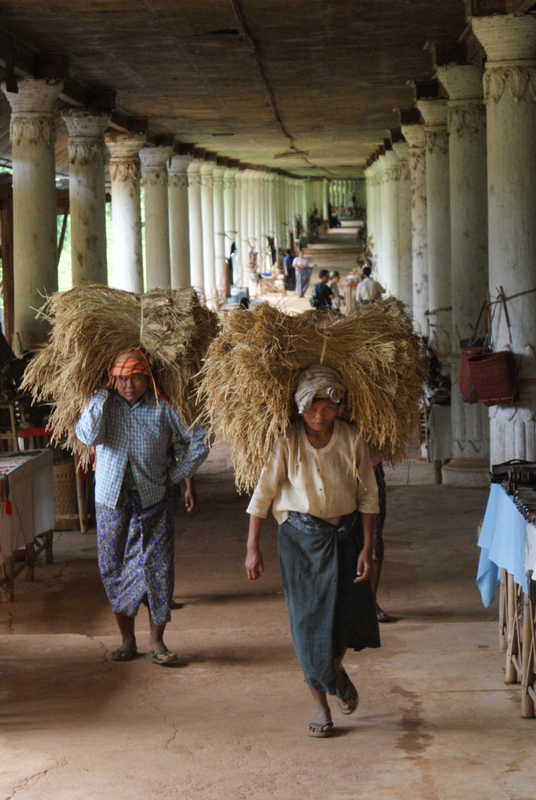 Nyaung Shwe is a small town with little to do. It has internet cafes and various restaurants, but not much else. The kids were mainly excited by the recommendation we had received for an Italian restaurant in town – with two locations! The food was excellent – all hand-made on the spot, so you need to wait a while as they crank out the pasta or in our case, the gnocchi. Apparently some time back an Italian chef had visited the town, taught some locals to make real pasta and pizza, and then those locals decided to open a restaurant serving genuine Italian food. Excellent though pricey, but only in Myanmar terms. We probably paid about $25 for our meal, very cheap in Canadian terms but quite expensive in Myanmar, where our family could regularly eat for about $15 very comfortably. Our hotel in Nyaung Shwe had been highly recommended on Tripadvisor, but it really didn’t suit us. The positives included a very pretty garden and a great pool. 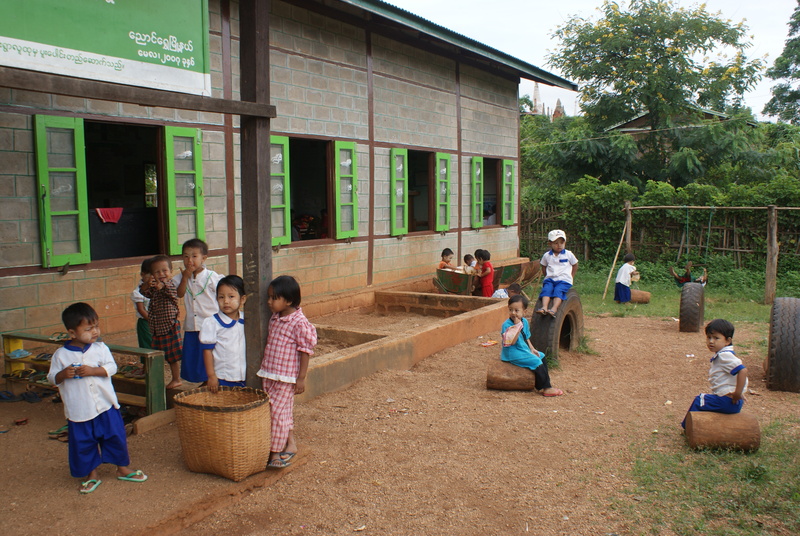 But we would have liked a TV and especially air conditioning – Myanmar has a very warm climate practically everywhere. While traveling we don’t mind the kids watching TV – in developing countries you seldom find American sitcoms or the Disney channel – it is more likely to be the news (from Russian, Chinese, Thai, German or other stations – you name it) or sport (they will sit through a soccer game with a Myanmar commentary) or something cultural, and the occasional movie. The hotel was on the outskirts of town near a monastery, and we heard prayers being broadcast late into the night. Our plan for the next day was to visit Kakku, deep in Pa-O country again. 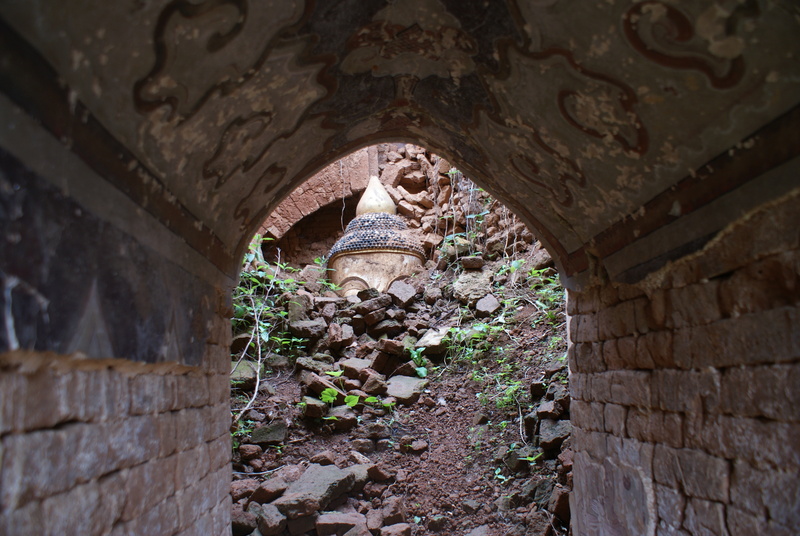 A Buddha head lies buried in the rubble of a collapsed pagoda - Indein. 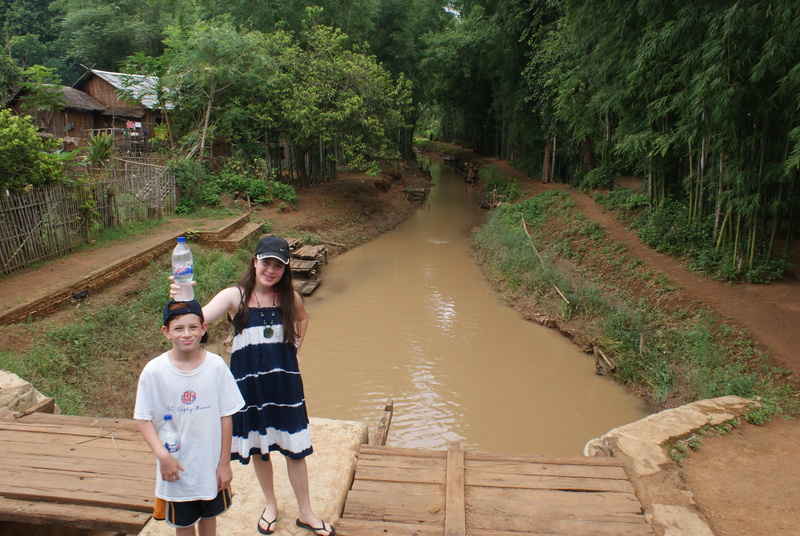 « Myanmar / Burma with Kids: Inle (part 2). A visit to Sankar (Sagar).